PSA has released many ‘meme’ lowers, and has more in the pipeline, but the “Approval-15” is arguably the greatest so far. It features the (in)famous ATF Guy (Peter Parker from the 1967 Spider-Man cartoon with an ATF ballcap photoshopped onto his head) prominently on the magwell and the selector switch markings ‘no & no’ (safe), ‘maybe, but no’ (semi), and ‘yes, but really no’ (full-auto). Like all PSA lowers, the “Approval-15” is built to MilSpec standard, made of forged 7075-T6 aluminum with a MIL-A-8625, Type III, Class 2 black anodized finish. It’s also reportedly only being offered once, so if you want to get one for yourself, now’s the time. 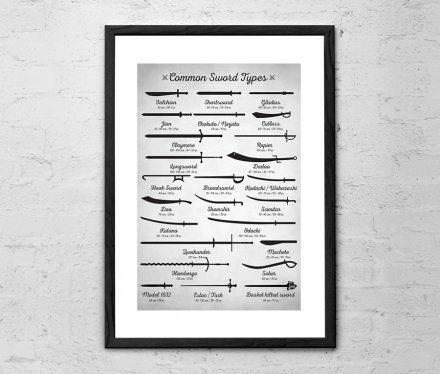 A nice addition to the office or mancave, this Common Sword Types poster from Etsy shop Zapista shows off various sword types of various cultures throughout history. 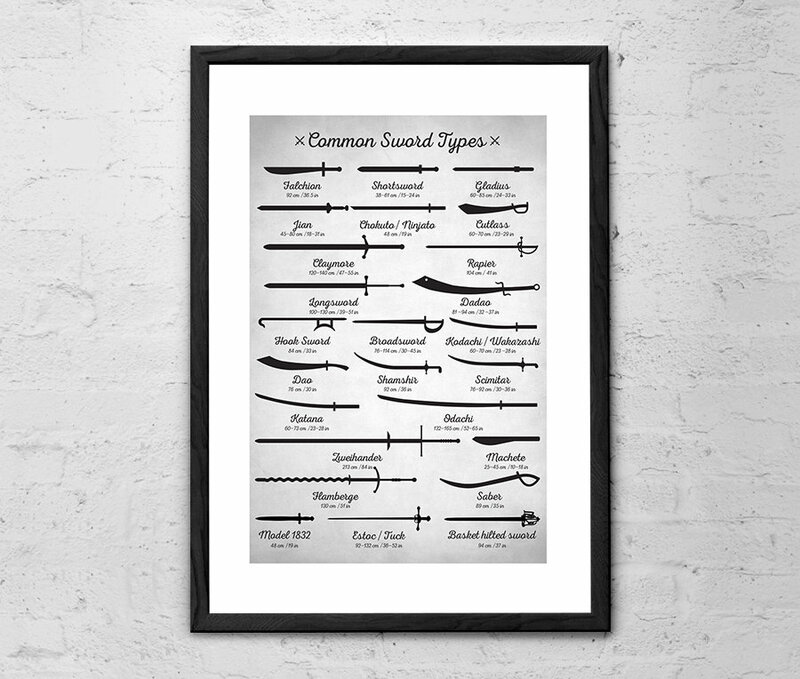 In addition to a silhouette profile of each sword, the poster also features their name and length in both centimeters and inches. The Predator on a tiki mug? 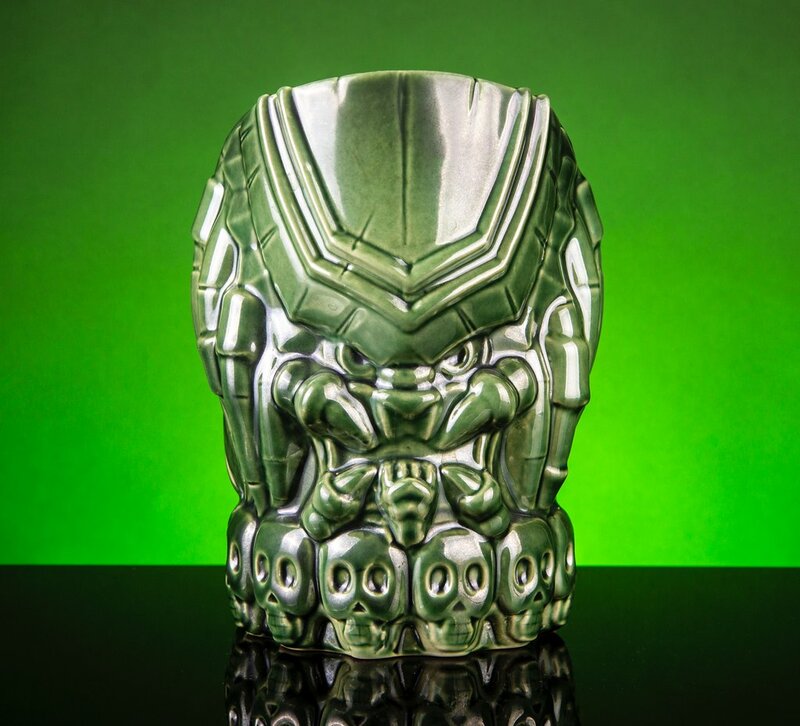 Yep, everyone’s favorite alien trophy hunter, now in tiki mug form. 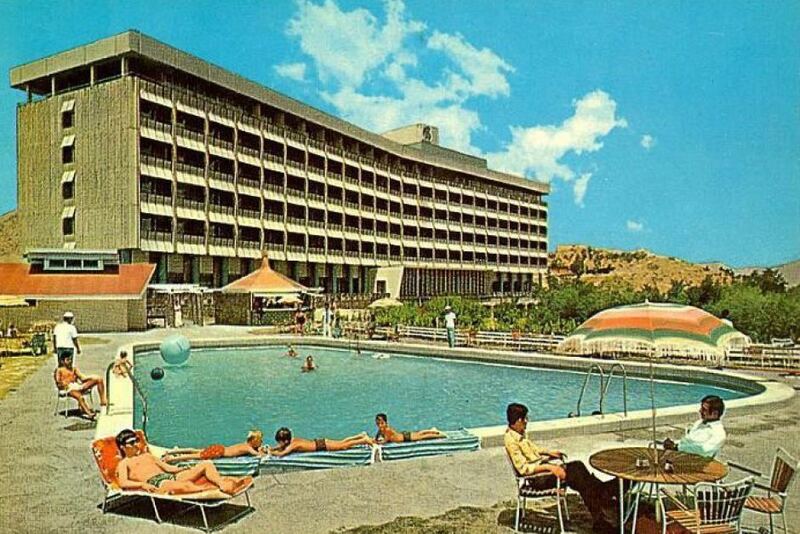 And, on the opposite side, you get Dutch Schaefer’s picturesque mug. 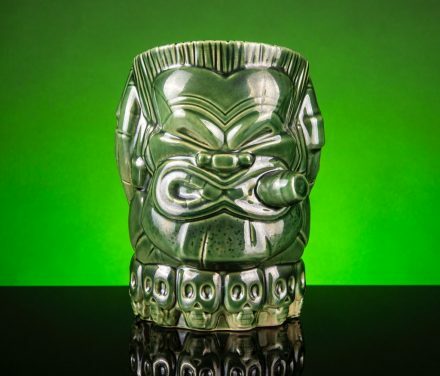 Holds 40 oz of liquid, and comes in multiple colors. 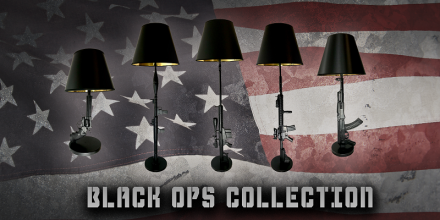 Seen above is the Val Verde variant, although 3 other variants (Standard, Mud Camo, and Jungle Came Alive) are also available. 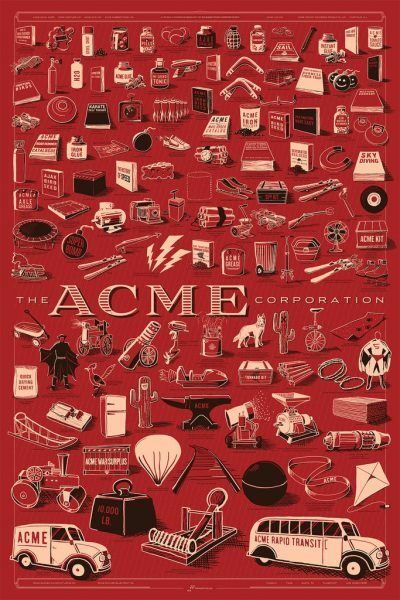 The brainchild of graphic designer Rob Loukotka, The ACME Corporation poster is a giant-sized 24″x36″ poster which features 126 individual ACME products. The products were sourced from 43 Wile E. Coyote & Road Runner cartoons produced from 1949-1994, which Rob Loukotka watched, then reproduced in his own style. Here’s to a solid 2019! So, did you get everything you asked Santa for? Posted in As Seen On Youtube, Morale | Comments Off on Merry Christmas, Ya Filthy Animals! Predator in a Rankin/Bass-style stop-motion holiday special parody? Awesome! 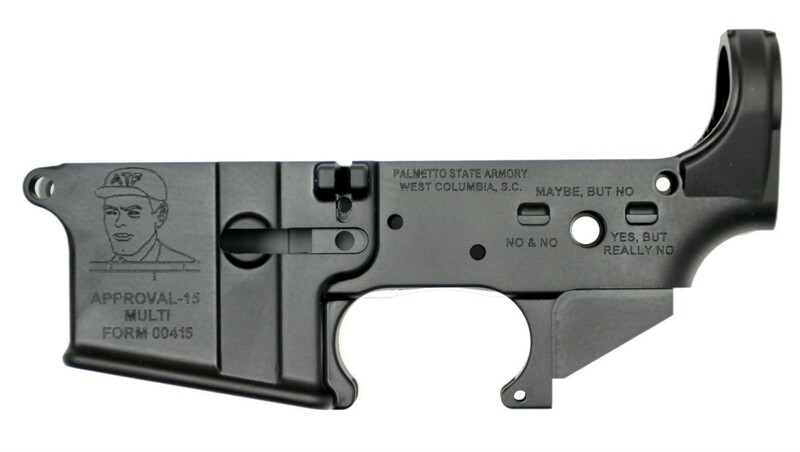 If you’re finding your meme AR-15 lower supply critically low, then you may want to go in for one of PSA’s SNEK-15 receivers. 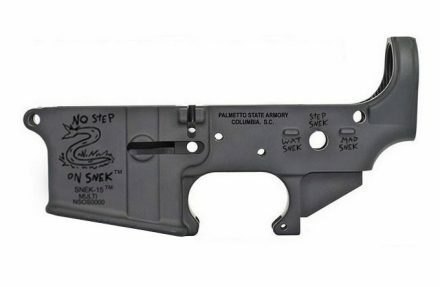 Available only for a single run, the SNEK-15 lower receiver is forged from 7075-T6 aluminum, and features markings inspired by the ‘No Step On Snek’ meme, derived from the famed Revolutionary War-era Gadsden Flag. The magwell features the No Step Snek logo, while the selector switch is marked ‘WAT SNEK’ – safe, ‘STEP SNEK’ – semi-auto, and ‘MAD SNEK’ – full-auto. The lower is MIL-A-8625, Type III, Class 2 black anodized. BOISE, IDAHO (November 21, 2018) – Do you remember when Kitfox Design Group broke the internet by creating a coloring book full of firearms? It’s hard to forget, since it sold like wildfire and was featured nearly everywhere. 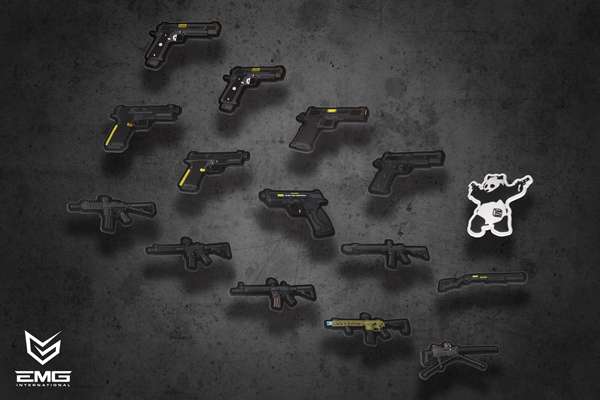 This time around Kitfox is releasing a set of five firearm themed cookie cutters. Available as of 9 a.m. Eastern Time today on the Kitfox Design Group website, there is no better way to express your love for firearms at Aunt Judith’s annual holiday party than a plate full of revolver shaped sugar cookies. Going to a boring holiday party and want to spice things up with some Krinkov shaped gingerbread cookies? You got it! “My wife and mother in law are giving me shady looks about the cookie cutters. 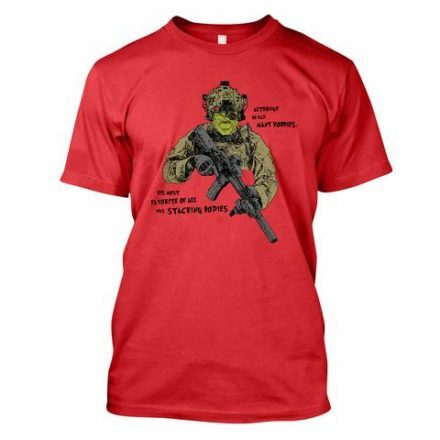 I love it!” They’re sure to trigger your safe space loving blue haired cousin, too. 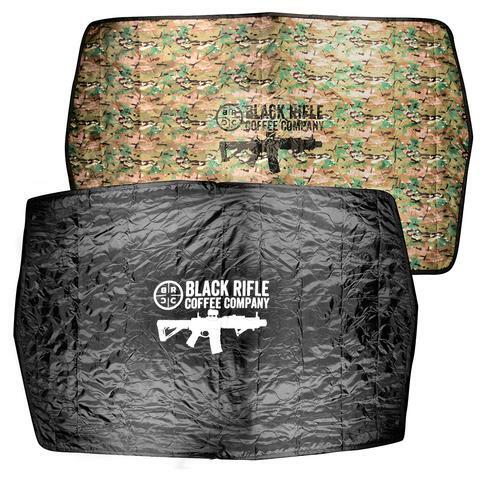 Maybe you’re just taking it easy this holiday season, and simply want to eat a glock shaped keto shortbread cookie with your veteran-brewed coffee while wearing your Kalashnikov-themed ugly Christmas sweater. Posted in Morale | Comments Off on Happy Thanksgiving! We here at TFB would like to give our sincerest, most heartfelt thanks to every individual who has served in the Military. From the very first militiamen to the warfighters of today, your sacrifices assure that we continue our way of life, freedom, and liberty. Again, thank you. Happy 243rd Birthday, US Marine Corps! Posted in Morale | Comments Off on Happy 243rd Birthday, US Marine Corps! This limited edition t-shirt from RE Factor features the ‘Body Stacker’ design, and is available just in time for the holidays. 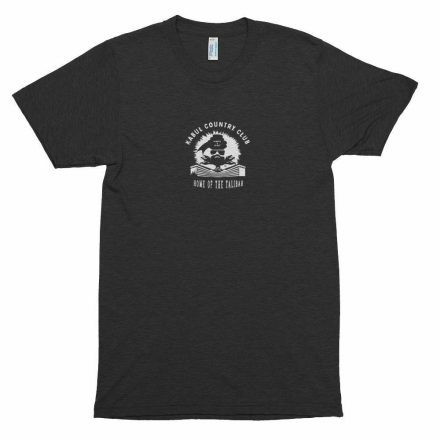 Shirt is 50/50 poly/cotton blend, athletic cut. 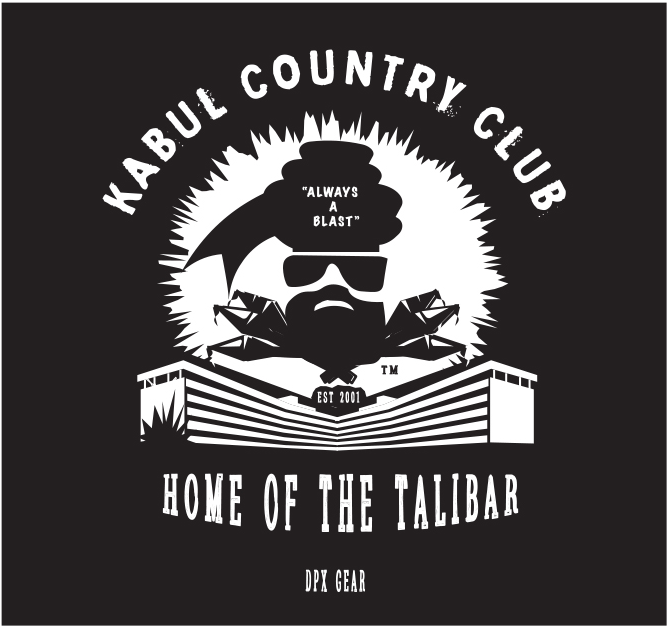 Available in sizes SM-2XL. Ships on November 20th. Houston, Texas (September 28, 2018) – The mission to fit disabled and severely injured protectors with a mobility solution that fits their lifestyle and equip them for continued service to our Nation, continues. Wheelchairs for Warriors has identified their next deserving recipient. Earlier this year they awarded an advanced wheelchair to Special Forces Green Beret Joseph “Joe” Lowrey of Ontario, California. He was shot through his helmet in Afghanistan in 2014 (during combat operations) from a high-powered rifle, which resulted in a traumatic brain injury and loss of the use of the left side of his body. Wheelchairs for Warriors next mission turned to the Marines, thanks to Tejano Veterans of Houston, Texas. 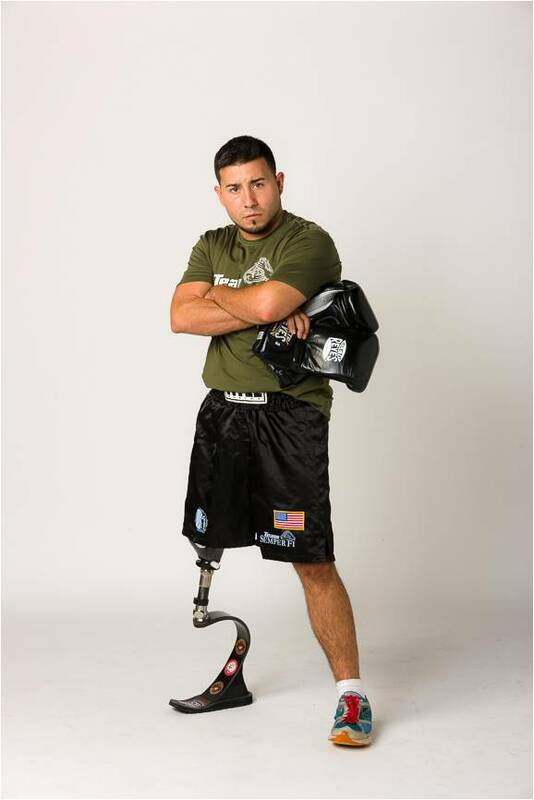 We were introduced to Eric “Iron Fist” Morante, a United States Marine Combat Veteran who served 3 tours in Iraq and was injured along with 7 other Marines and a Navy Corpsman, when a suicide bomber detonated 3,000 pounds of explosive under a 15-foot section of bridge. Sergeant Morante suffered a broken jaw and teeth, facial injuries, fractured wrist and his right leg was amputated, which has given him much discomfort given the limited options for movement of a very active Marine boxer who enters the ring as “Iron Fist” Morante. He currently gets by with a heavy and uncomfortable prosthetic leg and a pair of crutches. Wheelchairs for Warriors hero will be recognized and honored in Las Vegas November 7, 2018 at a red-carpet Producer’s Choice Honors (www.ProducersChoiceHonors.com) event, which will feature many prominent music and entertainment stars, including board member Susan Giacona. Wheelchairs for Warriors was founded to meet a unique need within the rescue and service community for those disabled in the line-of-duty, fighting for our country or rescuing people in harm’s way, to include Combat Veterans, EMS, Firefighters, and Peace Officers. Wheelchairs for Warriors provides custom-fit, complex, rehab mobility solutions designed for the warrior’s specific needs: depending on their injuries and lifestyle. These wheelchairs can be operated by head, finger, foot, shoulder, puff of breath, eye movement, etc. The wheelchairs can elevate and recline providing comfort and access while also providing relief to pressure points. The adaptive machines are designed by Paul Morgan, their Complex Rehab Seating Specialist. Wheelchairs for Warriors is currently seeking other wheelchair candidates across the nation. UK-based Jim’ll Paint It is a collaborative online storefront which consists of the works of an artist named Jim, and the “thousands of complete strangers who send him their weird and wonderful ideas.”, which are then turned into prints and printed on clothing items for sale. 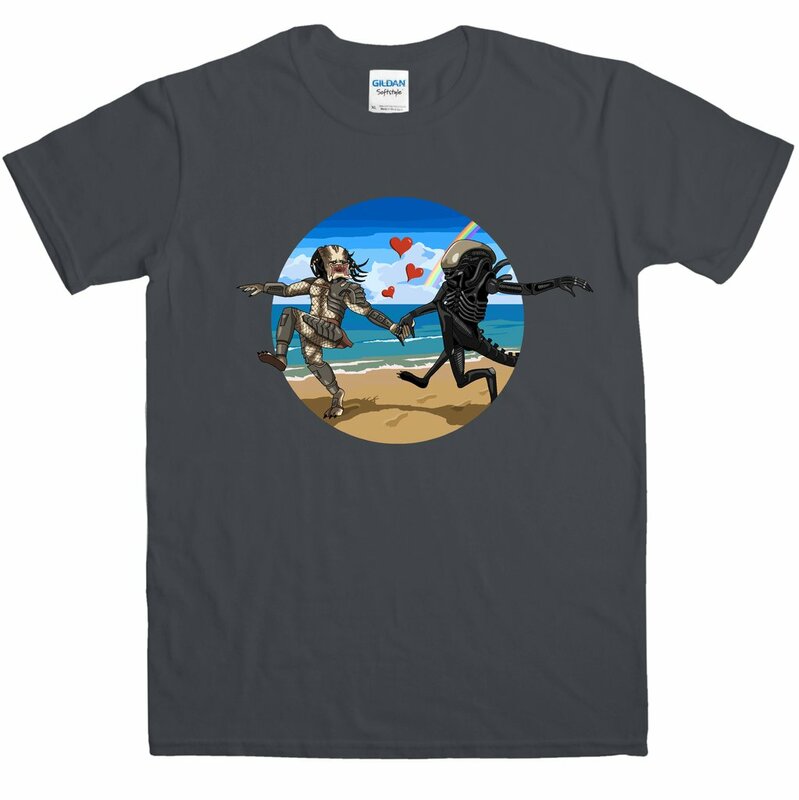 Unsurprisingly, many of these works happen to feature pop culture from various decades, including this A♥P t-shirt, which depicts one of the greatest hunters and one the greatest biologically engineered killing machines in the galaxy having fun at the beach, rather than trying to tear each other’s throats out, like usual. I’m also partial to the “Dad’s Army of Darkness” print, because, we’ll, it’s inspired by ‘Army of Darkness’. 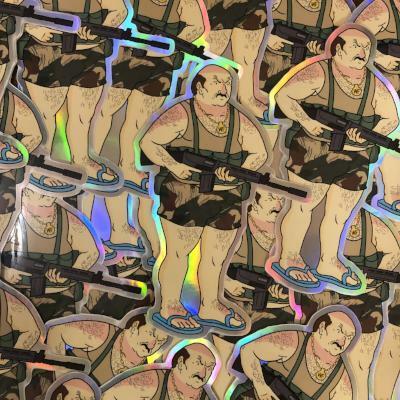 You can check out the rest of Jim’s products at jimll.co.uk. 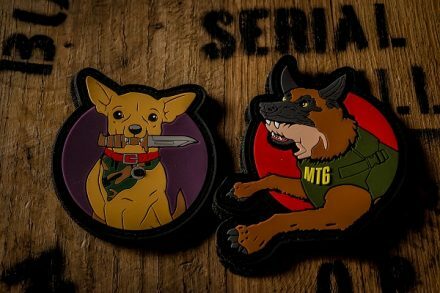 Defense Distributed is offering this limited edition ‘Come And Take It 2.0’ patch. 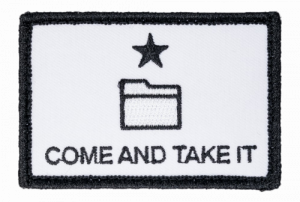 The patch is 2.5″ x 3″, hook and loop backed, and features a file icon above which is a black star, and below which are the words “Come And Take It”. For those who are unfamiliar, the design is based on the Gonzales Battle Flag featured at the Battle of Gonzales, the first battle in the Texas Revolution. Proceeds from the sale of this patch will benefit Defense Distributed and the Second Amendment Foundation in their ongoing efforts against 21 states currently trying to stop the publication of firearms blueprints online.